After striking miners were killed in what is known as the “Marikana massacre” of April 16, 2012, tremendous working-class indignation, organization and political consciousness has emerged. The article below was produced in December of 2013 to reflect on the process of rebuilding the fighting capacity of South African unions and the political organization of the working class. Despite the previous heroic role of the African National Congress (ANC) and the recently departed Nelson Mandela, the ANC has become the main ruling party of the South African capitalists, overseeing drastic neoliberal measures and the most unequal society in the world. Since the Marikana Massacre, the Democratic Socialist Movement (DSM), the affiliate organization of the Committee for a Workers International, has come to the forefront of the struggle. The DSM, in political solidarity with Socialist Alternative in the US, has, along with miners’ leaders, initiated a new political force called the Workers and Socialist Party (WASP). The statement below is from WASP. 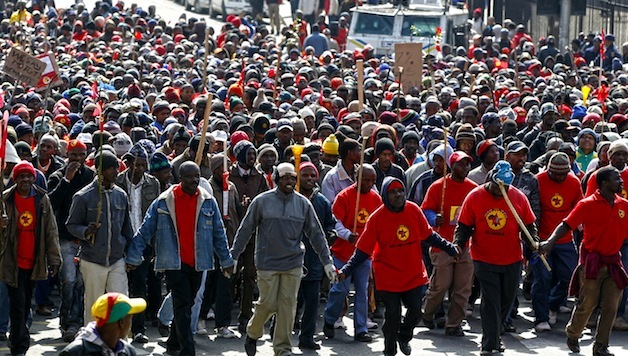 It addresses major developments in South Africa’s largest union, the National Union of Metalworkers of South Africa (NUMSA), a component part of the Congress of South African Trade Unions (COSATU), the main union federation. However, with the national and provincial elections only months away we invited NUMSA to “take its place in the leadership of WASP”. WASP was launched to unite the struggles of workers, communities and youth and is organised in a democratic and federal way that would have allowed NUMSA to use the WASP umbrella to stand its own candidates, selected by NUMSA’s own procedures. NUMSA could take its opposition to the National Development Plan into the national parliament as an ancillary to the struggles that will be waged in the workplaces and the communities. At NUMSA special congress the leadership laid down criteria that any political party would have to meet in order to warrant political support. These criteria were endorsed by the delegates in the adoption of the secretariat’s report. We believe WASP meets these criteria. WASP was born out of the struggles of the mineworkers and bases itself on the working class; WASP stands for the nationalisation of the mines, the banks, the commercial farms, the factories and other big business on the basis of workers control as part of the struggle for a socialist society; WASP is a thoroughly democratic organisation. As part of the adoption of their new political strategy, the NUMSA leadership was given a mandate to “be alert” to a “party committed to socialism standing for elections in future”. We therefore repeat our call for NUMSA to take its place in the leadership of WASP and support and stand candidates under the WASP umbrella in the 2014 elections as a crucial part of building the new Movement for Socialism. NUMSA sent a clear signal to mineworkers and other workers that NUMSA will not abandon them to the pro-capitalist misleadership of unions that continue to cling to the ANC. Irvin Jim declared that NUMSA “will no longer reject any worker” in open defiance of COSATU’s “one union, one industry” policy. Jim even lamented that this has not been NUMSA’s policy at the time of Marikana. This will put NUMSA on a collision course with the pro-ANC right-wing of COSATU and almost certainly lead to the break-up of COSATU. The decision to withhold their monthly R800 000 COSATU affiliation fee until the demand for a special congress is met is another bold move. WASP will be producing more detailed material and analysis of the tasks faced by the working class in light of the decisions taken at NUMSA’s special congress in the new year. Follow-up articles will appear on socialistworld.net and workerssocialistparty.co.za.